SO, this past week was very interesting. I had been talking to a friend and told him that if he needed eggs or just wanted to bring his kids out to meet the animals to just come on out! On Tuesday he did just that, he came out to buy eggs and brought his children (and his parents) out to see the chickens, ducks and goats. Of course for most of the week it was raining and Tuesday was no exception. As soon as they got out of their car the rain started and I don’t think it ever really stopped until a while after they left. The first thing we “toured” was the chickens since that was the closest indoor place to be out of the rain. The girls were fascinated by the chicks scratching for grains on the floor and when we checked the nest boxes they discovered that newly laid eggs are warm! They had to make sure to check for more eggs before they went home. Next were the goats. 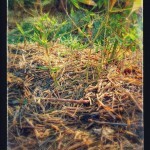 I introduced them to JuneCarter and Dolly, and they spent some time trying to feed them some weeds. I have to say the goats weren’t particularly interested in the weeds due to the ready supply of alfalfa hay in their feeder. Then we stopped briefly to see Rascal. They wanted to know why they could not just run up and pet him and I explained the difference between a buck and all the other goats. Then I took them all into the pasture to see the baby goats. I had the dad keep close track of his children in relation to the big boy (Oreo) and let them get up close with the other kids. They seemed to be impressed with how warm the goats are, but weren’t sure they liked Bird and Flower trying to climb on them with their wet/muddy/poopy hooves. We spent a few minutes marveling at the noise and smell and awesomeness of the ducks and then it was time to milk. I had offered to let the (human) kids in and give them a chance to milk a goat. I don’t think either JuneCarter or Dolly were happy with that decision , but, they went along anyway. I showed them the whole process for cleaning off the stanchion and how to get the goat up by offering peanuts. How to clean off the udder and then how to express the milk. They all took a turn and they all were able to get a little bit of milk out of JuneCarter. Even the Dad tried and was successful. Then we went into the house and “processed” the milk. I even had them try some after letting the dad know (disclaimer) that it is raw whole milk. The children weren’t too impressed with fresh warm milk, but Dad and Grandad thought it was much better than anything they could buy in the store. They paid for the eggs and took some rhubarb and left in the rain after checking the nest boxes one more time for fresh eggs. Byron (the dad) told me later that this is something they can read about in books in school, but to be out here and to touch, and hear, and feel, and smell where food like eggs and milk come from is a priceless experience. For me, to see the wonder and understanding lighting up a childs face as they suddenly know something they did not know before was the best part of my whole week. They were really well behaved kids! So, it has been raining for most of the month so far. My weather station has recorded 99/100 inches of rain in the first 8 days. Too wet to mow, but I now understand the meaning of the phrase springing up like a weed. It’s going to take me a week to pull weeds from the garden that I couldn’t even see last week! I wish the seeds I planted would grow like that. I have been getting a lot more milk this week, not as much as I will get when the kids are fully weaned. On Wednesday while shifting goats from one pen to another, Dolly suddenly decided to go exploring! I was having trouble getting my hands or a leash on her and at some point I slipped in the wet grass and mud and I think I pulled my left hamstring. So I have been kind of limping around, a bit slower than usual. Trying to catch ducks is a lot more entertaining these past few days. The P. Bisettii bamboo have been pushing up new shoots for the past few weeks, and now I see a new shoot from the P. Parvifolia! I guess that means I have been feeding and watering correctly. The new shoot is an interesting red color. 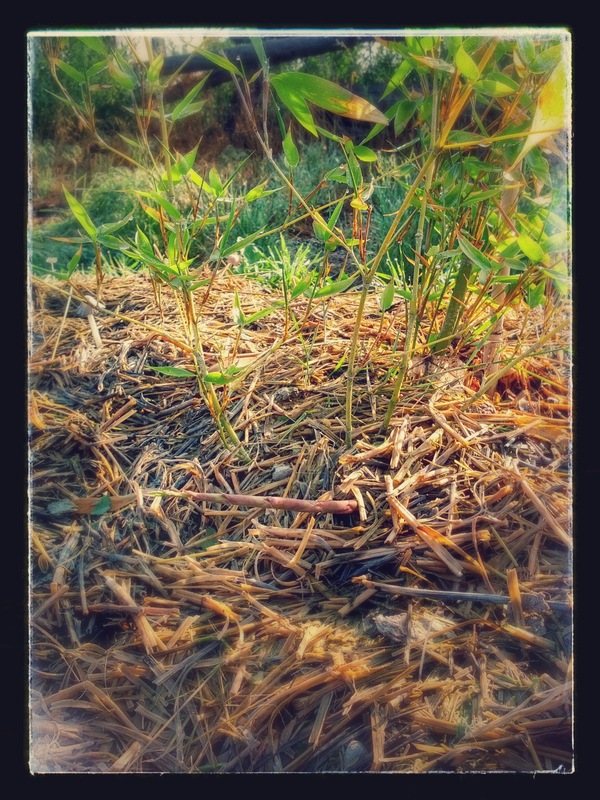 I look forward to the spring when all of the bamboo will be sending up new shoots and getting bigger.